April 12 is my 6 month anniversary at Microsoft, and also happens to be the date we've launched .NET 4 and Visual Studio 2010. Congratulations to the product teams who made this release happen! .NET 4 has had a ton of improvements, and Visual Studio 2010 with the new WPF interface and MEF-based plug-in model is an amazing piece of software. Having watched it grow from the different loosely-related IDEs (Visual Interdev anyone?) to the cohesive application is now has been a great process, and is something that makes me proud to work at Microsoft. Enough gushing, let's take a look at one of the areas in .NET of particular interest to me: WPF. If you don't plan to install Visual Studio 2010, you can get the full .NET 4 runtime here. Once you have the tools installed, you'll be ready to get started. Check out the resources below for some places to visit before you embark. This blog. I cover WPF, Silverlight and more. Consider subscribing as well as following me on twitter. I put out a weekly link blog of Windows Client developer links. You can find them here. Silverlight and WPF are close cousins. My colleagues Jesse Liberty, John Papa and Tim Heuer always have great Silverlight content. Visit the WindowsClient.net get started page. .NET 4 is the best .NET release to date. I'm really proud of what the teams accomplished here, from the new features in WPF to integrating MEF, to the performance improvements, to the newer, smaller client runtime. Awesome stuff. Throughout the rest of this post, I'm going to walk through the features that I think are important for WPF developers. Visual Studio 2010 has had a complete overhaul on the UI side. However, did you know we threw in a few WPF goodies just to round things out? I previously blogged about tracing in VS2010 here. The new designer in Visual Studio is better than ever. I'm a xaml editor kind of guy, but I can't help but be impressed with the new designer's capabilities. Not only do you get all the usual control placement and alignment tools, but binding elements, or extracting them as resources is only a context menu away. For more information on what's new in Visual Studio 2010, check out the MSDN page here. In previous versions of WPF, we provided a decent, but not perfect, text rendering implementation. We concentrated more on making sure subpixel layout of text worked correct, scaled correctly, animated correctly and otherwise behaved well in your applications. At the same time, however, we've heard you loud and clear on how you want text in WPF to be as crisp and clean as GDI/DirectWrite rendered text. The text stack in WPF 4 was rewritten from the ground up to offer you the option to display text that is indistinguishable from native applications in Windows. Here's a screenshot of GDI-compatible WPF text. The new Clear Type Hint API provides more control over when ClearType is used. Essentially, you're helping the text and rendering stacks make more educated decisions about where and when to apply ClearType font smoothing. WPF 4 adds the ability to change the brushes for the caret and selection text inside TextBox and similar controls. See my blog post on changing the caret and selection brushes in WPF 4. WPF has had a spell-checker enabled for some time. However, it has always used the OS spell checker. WPF 4 now includes the ability to provide additional custom dictionaries to use for spell checking. Where would WPF be without its great graphics stack? WPF 4 adds some nice enhancements in the quality, performance and capability areas. Why use this instead of pixel snapping? Pixel snapping didn't work in many situations due to its render-time calculations. Layout rounding is more predictable and, as a bonus, is Silverlight-compatible. see my blog post on layout rounding. In this release, we introduced the concept of hardware-accelerated cached composition. This can be a huge win for render-heavy layouts that are cache-friendly, particularly layouts with lots of vector elements. Cached Composition is now supported directly in the framework via the UIElement.CacheMode property and the BitmapCacheBrush. The BitmapCacheBrush is essentially a a visual brush which pulls from the cache. WPF now supports Shader Model 3 pixel shaders (ps3.0). That means you can now create even more interesting and complicated effects. the PS3 model enables more instructions, more registers, more texture indirections and better flow control. One caveat, however, is Pixel Shader 3 has no software fallback. The class has tons of other useful properties and methods as well. It's a good practice to check the capabilities of the machine and then cleanly downgrade functionality if the required support is not present. The old legacy bitmap effects (bevel, drop shadow, blur etc.) are still present, but there's zero implementation. The effects that have shader versions (blur, drop shadow) get forwarded to the shader implementation. The other effects (bevel, for example) simply do nothing. Your code will compile, but the effects themselves are no-ops. In .NET 3.5sp1, they were marked as deprecated, so this is not surprising. Bitmap effects are software-only, and couldn't be hardware accelerated. One of the biggest performance issues with old WPF applications was use/overuse of bitmap effects. Pixel shader-based effects are much more performant. I'm glad to see we aren't afraid to cull when we come up with something better. The replacement effects are just as easy to use as the old effects, and will even render on the design surface. Easing functions are a great way to add bounce and pop to your animation. There is a prebuilt set of functions as well as the capability to create your own easing functions. Easing functions simply alter the value over time either on the in or outgoing event. The xaml below shows an easing function in use. I wrote a blog post some time ago explaining how to use easing functions in WPF 4 and Silverlight. Also, there is an accompanying video and another blog/video pair explaining how to create your own custom easing functions. I'm happy to see all of these controls make it into the framework proper. The DataGrid, in particular, is an accomplishment. If you've ever tried to write a grid control of your own, or you looked at the DataGrid source on codeplex, you know that creating a datagrid type control is a serious amount of engineering. This is also another case of releasing things early and often, via codeplex (with source), and then when they mature, including them into the framework itself. I'm pretty happy with this model. You can now bind commands to input bindings. For example, you can associate a command with a KeyBinding on a treeview or menu. This better supports patterns like MVVM/ViewModel where you want to associate all your UI to VM actions via ICommand set via binding. If you can access a property in code, you can now bind to it. But now we get more than just anonymous types: we can bind to dynamic types, even those resolved at runtime. This means you can even data bind to those IDispatch COM objects you've been using to automate Office, and use binding with the DLR. Speaking of binding, you can now bind to runs of text inside a TextBlock or a FlowDocument. This allows you to compose more complex text, that still flows correctly, without having to resort to custom code. Binding is essential to WPF and Silverlight development. The more that's bindable, the happier I am. This is one instance where Silverlight (along with Expression) introduced something incredibly awesome, and WPF has been able to pick it up and include it in the full framework. VSM has been available to WPF developers since .NET 3.5sp1, but it was in a toolkit library at the time. The syntax hasn't changed, though, so what you learned with 3.5sp1 and with Silverlight all continues to apply. Windows 7 is the first Microsoft desktop OS to bring multi-touch capabilities as part of the core. WPF 4 does a great job in surfacing those multi-touch and manipulation capabilities for use in our own code. While you get baked-in touch capabilities in controls deriving from UIElement, and automatic promotion to mouse events, the main events you'll want to use are the ManipulationStarting, ManipulationDelta, and ManipulationInertiaStarting . Those let you create a truly custom touch experience with your own gestures, inertia and physics. WPF 4 provides a full suite of integration points with the Windows 7 shell and taskbar. 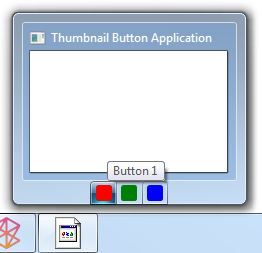 We get OS-specific common dialogs (Windows 7 and Vista) including the ability to customize them using FileDialogCustomPlace, as well as the ability to overlay status and icons on the taskbar, control the jump list, add icons to the thumbnail window and more. If you really want to light up on Windows, WPF makes it easy for you, especially with the new TaskbarItemInfo class. There are a number of good videos and blog posts on these topics. Please check them out. The Managed Extensibility Framework (MEF or "Glenn Block's Project"<g>) is now rolled into the full .NET framework. Not only is it a great way to dynamically extend your own applications, but it's also the way the IDE is extended in VS2010. Many personal computers and workstations have two or four cores (that is, CPUs) that enable multiple threads to be executed simultaneously. Computers in the near future are expected to have significantly more cores. To take advantage of the hardware of today and tomorrow, you can parallelize your code to distribute work across multiple processors. In the past, parallelization required low-level manipulation of threads and locks. Visual Studio 2010 and the .NET Framework 4 enhance support for parallel programming by providing a new runtime, new class library types, and new diagnostic tools. These features simplify parallel development so that you can write efficient, fine-grained, and scalable parallel code in a natural idiom without having to work directly with threads or the thread pool. The following illustration provides a high-level overview of the parallel programming architecture in the .NET Framework 4. In this day of Silverlight browser applications, you may wonder about what's going on with Xbaps. It turns out that a good number of customers are using them in their own applications. I talked with several at PDC09. One thing we've done to improve the xbap experience and to help give xbaps a bit more parity with their Silverlight cousins is providing script access. Xbaps can now interop with script on the browser. For an overview of what's new in .NET 4 itself, check out the MSDN page on .NET 4. There's more coming in WPF-land as well. Later this year we'll see more news on the Ribbon control as well as some awesome touch libraries from the Surface team. We're also right in the middle of WPF v.next planning. If there's something you want to see in the next version, please go and vote it up on the WPF uservoice voting site. Nice overview! Thanks, I was looking exact for such one! Happy Anniversary and great writeup! I just finished installing, so excited.. So happy to get to take my .net 4 applications live. Hey, how about a 6 or 8 pixel left margin on this blog? The 0-pixel left margin is just hard on the eyes. Your browser showed up as IE8. Is that what you're running? The content should be centered in the browser window. Even at 1024x768 there's a small left margin in IE8. Yes, this is IE 8. My browser window is not wide enough to show the entire width of the content. In that state, your blog's content is slap up against the left hand side of the browser, no margin whatsover. Go to like bing.com and make your browser window so narrow that you get a horizontal scrollbar. Notice that bing.com still has a comfortable left margin. What resolution are you running, or do you just keep your browser narrow? I'll take a look at this on my next round of revisions, though. Just let me know what res you're running. Resolution is 1280x1024. I'm just not one of those dweebs that runs everything maximized. Showing the scrollbar isn't the issue; I'm fine with that. I've just never seen a blog that behaves like yours, with the text slap up against the left edge of the browser window, Take a look at Bea Stollnitz's blog or the WPF Text Blog. Thanks Mr. Brown. Nice to see the new features of WPF. Thanks for doing WPF 4 new features rollup post, really a good one so far. I still no see the advantage of WPF, at least in the real world of business apps, sorry. I'm not here to convince people to use WPF or Silverlight or any other technology. No apologies needed. That said, what are you comparing to? I've read a book on WPF and used it in the UI of a research project. Now, we're going to use it in a mission-critical large enterprise app. I see, just by reading about the features you can keep on thinking: "I can already do this in winforms, or even native code", but compare it with the similar "I already can" about OOP: everything you do with OOP can be done without it, and sometimes even easier!!! The point is that the same way that OOP showed its magic when you get serious about your software architecture, WPF stands out only when you get want cool UI in a large app, where custom developer codes become too costly in terms of time and price. Also, we, the developers are somehow trapped to think of user interface according to the limitations of the old technologies. As I use more WPF and have to spend less time dealing with my previous software, I find myself getting free of those limitations. Believe me, sooner or later, this new technology (or some not yet published competitor) will replace the traditional interface technologies, at that time I like to be a expert, not a newbie. I think that Microsoft created enough confusion about all this stuff...WPF is a big technology that can't be masted in a week or so (see the books about it, 1000 pages each!). I, for example, tried to learn it twice but all of a sudden, some "event" or announcement like that of Silverlight on PDC, hold me back. I am new to WPF world. I have a basic knowlege of WPF topics. I would like to appreciate the way you have given the overview of new features of WPF. I really very well done. Thanks for this. Thanks for your information on WPF. Its really helpfull for those who want to start WPF.